Soft Sole Giveaway for Sandal Ready Feet – Open Worldwide! I suffer a little bit from hardened hooves and now sandal season is in full swing, they need a bit of TLC before they meet their public! 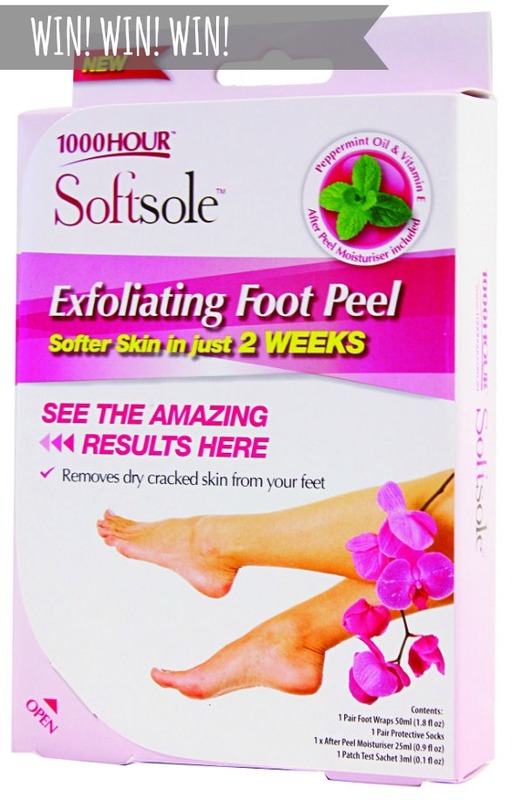 Soft Sole is without a doubt the best at-home treatment I’ve tried for removing dry skin – there are similar products out there, but this did the most thorough job and left me with incredibly soft and smooth feet. In one easy to use kit, you get a foot peel along with a pair of socks, patch test, instruction booklet and after peel moisturiser. The peel itself is comes in two plastic booties containing a mixture of natural ingredients, including salicylic acid, castor oil, gylcolic acid, lemon Extract and Vitamin E. After application, the dead skin peels off in 3-7 days, and the process takes 2 weeks to fully complete. The best bit? I have three kits, worth €19.99 each, to give away and the giveaway is open worldwide. Just pop your details into the box below and if you’re not lucky, don’t worry – you should be able to find it in your local chemist! Check out the Facebook page or website for more – and good luck! This sounds really good, i need to try something like this mine have seen better days! I don't normally enter competitions but this actually looks cool. My feet are in a hoop lately! Heading on a beach holiday in early August but moving house before that so I will need this to have pretty feet as I'll be wrecked! This sounds the perfect antidote for summer feet! This is perfect to create sandal ready feet! For anyone curious this is way better than the new machines on the market, love it! I really need this hahaha! My foot is so dry! Sound great! Would love to try it! I've been looking for one of these but having no luck for the past few weeks! Oh I would love to tries these on my trotters. Sounds great, I too share you pain when it comes to sandal season. Have tried loads of different techniques but to no avail maybe this is what I have been looking for. Great post! Would love this feet do be wrecked from work so when it comes to getting the sandals out their not a pretty site. oh would love to try this, going to Italy for my 50th birthday and need my feet looking good! this sounds fabulous. would love to try. just entered. Ooh i love foot treatments.. will deffo have to pick this up!! I could definitely do with using one of these! Awesome giveaway! In perfect time for summer :) My Hubby has the softest feet ever because he never takes of his shoes and I'm jealous haha! this sounds great - i def need somethin like this! This sounds great. My feet are in an awful state at the moment! The sounds so nourishing for feet, would like to give it a try. Thanks for your kind words, Have a wonderful weekend hun! I need this to beautify my feet! I entered the giveaway! If I don't win I'm going to buy it online, it sounds great!! Have a great weekend sweetheart! love the giveaway!...hope to win! Hi and thanks for the giveaway. I have never heard of this before. But would love to try it. My friend has been using these (or something similar) would love to try it out! This looks amazing, dry feet and sandals is not a good look! Great comp. Have heard a lot about this product. Would love to try. I have a miiiild phobia of feet that I'm trying to shake off by embracing my own feet haha, would love to try this, it sounds like a fab product and maybe I'll be brave enough to get my feet out this summer after all! I could really do with winning this, my feet are looking terrible! All the sunny weather has me walking round in bare feet a lot and it's taking its toll - this prize would be amazing! have been meaning to try one of these!! This sounds fab, my feet are no longer the soft pretty things they once were, probably from too many cheap high heeled shoes! I have my youngest daughter's hen party coming up & my feet definitely need some sorting out! My feet totally needs this! would love to try this, my feet are awful! After a couple of hot days in sandals, my feet need a bit of TLC!